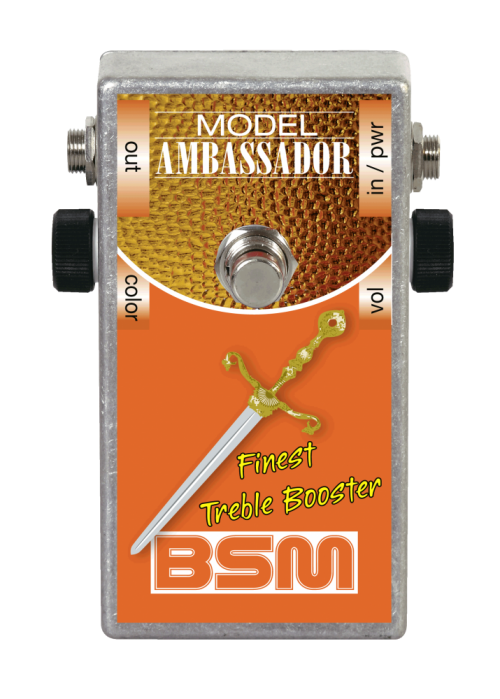 Based on the best classic boosters, the BSM Ambassador - a germanium treble/midrange booster, is a crossover between the Rangemaster Booster, the Orange Booster and the Winston Booster. The transistors are specially selected to pass the strict internal BSM factory QC guidelines. Classic boosters never cared about the midrange, and that's what makes the Ambassador stand out - the midrange and the treble range are both inside this little box. From crystal clear highs to fat and meaty mids, it's easy to dial in all these sounds with every common pickup. With the "color" control set to midrange, a singlecoil pickup really sounds like a PAF humbucker, and a PAF like fat and overwounded humbucker. The Ambassador is loaded with a special selected original NOS germanium transistor from the 60's, like the Winston Treble Booster was. From the late 60's to the mid 70's almost all british rock guitarists used single coil pickup guitars and some type of germanium booster. By the end of the seventies, these boosters were replaced by a new circuit from Japan, the socalled Tube Screamer and other similar overdrive circuits. These were based on the old boosters and therefore had a very similar frequency response. The germanium boosters on the other hand, sadly fell into oblivion despite their unique and inimitable sound. The Ambassador Booster is inserted between the guitar and the amplifier, not into the FX loop. The magical tone is achieved by the interaction between guitar pickup, booster and amplifier. The unit is powered by a 9V battery with a current consumption of aprox. 250 uA. The average output level is 7dBm, the maximum output voltage when the strings are struck really hard is 5V max. Note: The positive pole of the battery is ground. If you have any questions concerning our products, especially the BSM Ambassador Mid-Voiced Treble Booster, our tech-head and mastermind Mr. Bernd C. Meiser would be happy to talk to you. So don't hestitate any longer and send him an email to info@treblebooster.net or use the contact form to contact him.